When people think of landscape architects, they often conjure ideas of someone who spends all day at the nurseries or digging in the dirt. However, there is a lot more to landscape architecture than the placement of pretty plants to wrap around the exterior of a home. 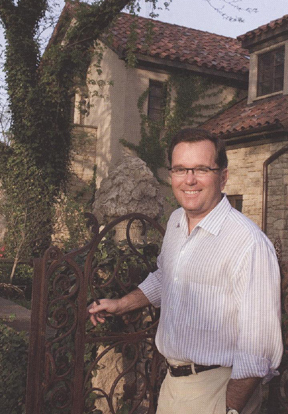 As Reed Dillon sits down to tackle any upscale residential or commercial endeavor, he knows his job goes well beyond sowing plants and the laying of rock work. He acts as a general contractor for most of his projects, hiring subs and managing often enormous ventures where pools are constructed, fireplaces erected, foundations transformed: this is not just about digging in the dirt. The work requires a meticulous eye for detail, a knack for the unusual, knowing what flora thrives, having an extensive list of creative masons, sculptors, tile layers, concrete specialists, and the ability to bring it all together to shape magnificence. Dillon attended the University of Kansas for his undergraduate work, which is where he met his wife, Stacey. It was during that time that his maternal grandfather first gave Reed a copy of a landscape architecture magazine. Living in Kansas, landscape architecture was not prevalent and this became his first real introduction to the idea. He worked one summer during his studies at KU at the Bartlett Arboretum outside of Wichita pruning, weeding, trimming and absorbing the life of plants. After earning a liberal arts degree, Dillon packed his bags and moved to Philadelphia to attend the University of Pennsylvania where he received a master’s degree in landscape architecture. After the general idea is conceived, a preliminary drawing is created with the hardscapes and flora placement, to convey the feeling and flow of the space. Once that is approved, a drawing of the construction phase is produced with electrical wiring, plumbing and basically the bowels of the project in place. Reed tries to work around the existing landscape as much as possible. He recommends that people hire a landscape architect in the beginning of the home’s construction if at all feasible. His garden is his favorite creation because it is the most personal vision he has been able to accomplish. “If you are shopping at salvage yards and antique shops and you see something that is interesting, you have to be spontaneous and buy it. Even if you don’t know where to place it now, store it away and you’ll find a perfect place one day,” offers Dillon on creating a unique space. Orchestrating the construction of a sophisticated landscape design can be a real challenge. Pools, terraces and fountains require permits, many different sub-contractors, and tight schedules. We make it easy for you, because we know the sub-contractors and the quality of their work, and how to schedule it all together. We only use the best quality materials available. Our trees and shrubs are hand selected with an eye toward future growth, with healthy, fully developed root systems. We use first grade bed preparation materials such as compost and mulch. On the irrigation and lighting side, we use brass and copper for underground water connections, Hunter and Rainbird heads, and Vista and Nightscaping low voltage light fixtures. All of this is planned to give you the best quality, lowest maintenance installations possible. We train our installers in the proper techniques necessary to do a quality installation. If it is done right the first time, we save money by not having to go back, and you get a top-flight job. We have a safety program in place to prevent injuries, and we carry all of the applicable insurance to protect you. We will be there from beginning to end, and will hold your hand throughout the entire process. Our job is to make the project go smoothly, and anticipate any problems or headaches before they happen. Let us do the worrying – all you need to do is sit back and enjoy the final result! As part of our quality control, we will ask you to rate our service after the job is completed. We want to know if you are happy, and will go to almost any length to ensure that you are! Simply put, we believe that we have the best sense of aesthetics around. We can interpret your ideas and translate them into the vision that you have always imagined. You want that sophisticated, “out of a magazine” look, and we can do that better than anyone. Look at our portfolio and see if you don’t agree.